7" DuraTech Chimney is designed for appliances that are tested and listed for use with a 2100°F HT chimney system, such as wood stoves, fireplaces, furnaces, boilers, stoves, ranges, water heaters, or other appliances fueled by wood, oil, coal, or gas. 7" DuraTech Chimney is tested to UL test procedures 103HT 2100°F and listed under UL re-examination service number MH 7399. 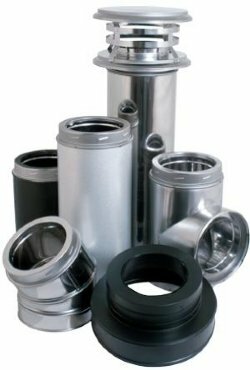 7" DuraTech Chimney is available in stainless steel (SS) outer-casing and stainless steel inner-liner with twist-lock connections. To calculate installed length of 7" DuraTech chimney, subtract 1 1/4" from each joint overlap of chimney pipe. Important: Allow a minimum of 2-inch air space to combustibles when installing DuraTech chimney. 0.015" 430 stainless steel outer wall. Twist-lock end rings provide for ease of assembly. Now FULLY warranted to the Internet purchaser by Hart's Hearth Inc.!!
" M&G DuraVent provides no warranty for the following professional products if such products are not installed by a trained professional installer: DuraTech®, DuraPlus HTC®, DuraChimney® II, PelletVent Pro®, DirectVent Pro®, FasNSeal®, FasNSeal® W2, FasNSeal® Flex, and PolyPro®, and M&G DuraVent's relining products including DuraLiner®, DuraFlex® (SW, Pro, 316, 304), and Ventinox®." We feel having a warranty on the products we sell on our site is VERY IMPORANT, so we have dropped DuraTech as our Top Choice. Our Top Choice is now Ventis. BUT NOW....DuraTech IS FULLY warranted to the Internet purchaser by Hart's Hearth Inc.!!! That's right, Hart's Hearth now picks up the warranty where Duravent has failed to provide one, to you, the Do-It-Yourselfer! NO ONE ELSE on the Internet will provide a warranty for DuraTech Purchases made on the internet, only us here at Hart's Hearth Inc. will provide you a warranty. We provide the same LifetimeWarranty as DuraVent provides for professional installations except for coal burning applications. Have questions about this warranty? Go to our Support Form and ask, we will return an answer within 72 hours. Check out our Typical Chimney Installation Diagramsto get an idea how Class-A chimney is installed and download 5" to 8" installation instructions (1.06 mb PDF) to familiarize yourself installing a DuraTech Chimney. Product Note: All "Special Order" items have a 2 week lead time and are not covered by any delivery guarantees. 7" Adaptor / Slip Connector 14"
30 Degree Galvalume Elbow Kit; DuraTech 7"
Includes 2 elbows and strap. 48" Galvanized Chimney Length; DuraTech 7"
15 Degree Galvalume Elbow Kit; DuraTech 7"
Roof Support; fits DuraTech 5" & 7"
Round Ceiling Support; DuraTech 7"
Round Support Trim; Fits DuraTech 7" & 8"
Square Ceiling Support: 24" tall; DuraTech 7"
Tee with Cap; DuraTech 7"
6" Stainless Steel Chimney Length; DuraTech 7"
12" Stainless Steel Chimney Length; DuraTech 7"
18" Chimney Length; DuraTech 7"
24" Stainless Steel Chimney Length; DuraTech 7"
36" Stainless Steel Chimney Length; DuraTech 7"
48" Stainless Steel Chimney Length; DuraTech 7"
15 Degree Stainless Elbow Kit; DuraTech 7"
30 Degree Stainless Elbow Kit; DuraTech 7"
Elbow Strap, Galvanized; DuraTech 7"
Roof Support Trim 0/12-3/12; DuraTech 7"
Roof Support Trim 4/12-6/12; DuraTech 7"
Roof Support Trim 7/12-9/12; DuraTech 7"
Roof Support Trim 9/12-12/12; DuraTech 7"
Flat Roof Flashing; DuraTech 7"
7-12/12 Roof Flashing; DuraTech 7"
0-6/12 Roof Flashing; DuraTech 7"
Extended Roof Bracket; DuraTech 7"
Storm Collar; Fits DuraTech 7 & 8"